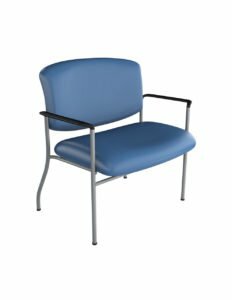 Made with high quality materials and superior construction; the Bariatric Guest Series provides cushioned comfort for guests requiring a larger seat. Ideal for offices and waiting areas that require comfortable seating, the Series offers three sizes to accommodate larger body types as well as room configuration requirements. The Chair's robust design allows for a weight capacity up to 750 lbs., ensuring it can sustain heavier loads over time.